Admired by designers and interior decorators and sought after by collectors, William Yeoward is an invitation to living with style. 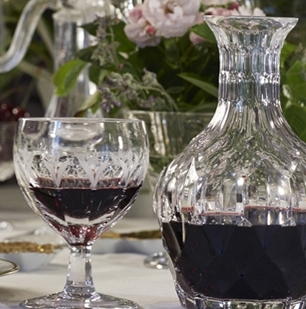 We carry a selection of William Yeoward Crystal, Country, and American Bar in our store. When not in stock, items can be ordered for delivery within 5-7 days when in stock in the United States, or 2 -3 weeks when coming from England. We will notify you regarding delivery time. Please call us at 202-244-7197 with any questions. William Yeoward Crystal is inspired by antique pieces originally made in England and Ireland during the 18th and early 19th centuries. Every piece is entirely made by hand using the same traditional methods employed over 150 years ago. Unusual hand cutting and engraving are distinctive elements of William Yeoward Crystal, producing beautiful yet practical pieces. William Yeoward Country is a stylish and practical alternative for use at breakfast, lunch on the terrace or dinner around the kitchen table. The shapes are simple and functional but have all been created with great attention to detail so that they are not just useful but are also beautiful in themselves. William Yeoward American Bar is collection of contemporary handmade barware evoke the style and glamour of the 1920s and 1930s when the new experience of Cocktails and Jazz was all the rage. Today we see a new passion for Cocktails and Mixology; these drinks take time and skill to create – they deserve a beautiful glass! Our Collection of stylish William Yeoward Photograph Frames is produced from the finest Silver Plate. Each of the exclusive designs has unique characteristics. Styles range from clear or colored glass rods, semi-precious stones, gold or platinum rods, shagreen, and bamboo. All the frames are gift boxed for perfect presentation.